AUSTIN, Texas — Longstanding ideas about the face of one of the most famous works of Aztec sculpture are being challenged by a new theory from a University of Texas at Austin researcher. Art history professor David Stuart argues that the image on the Aztec Sun Stone is more than a calendar or a simple representation of the sun god, but rather a named portrait of the ruler Montezuma II as a “sun king,” dedicated a few years before the arrival of Spanish conquistador Hernán Cortés. Scholars have debated about the identity of the central face on the stone for more than 100 years, but this new line of inquiry from Stuart shows there may be more to the story. 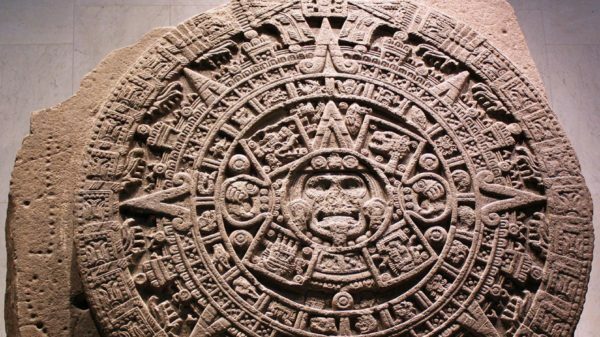 The famous stone, also known as the Aztec Calendar Stone, was unearthed in Mexico City in 1790. It is almost 12 feet in diameter and covered in hieroglyphs, with a solar deity at its center. Stuart believes that the two glyphs that appear above the central face refer to Montezuma II and the Méxica patron god Huitzilopochtli. Based on what scholars know about text-image relationships in Mesoamerican art, Stuart hypothesizes that their placement has a direct bearing on the identity of the face itself. In Méxica art, name glyphs seldom function as standalone entities and are instead almost always found in conjunction with portraits and images as a means of image identification. Stuart argues that they both label the central face of a deified king — Montezuma II — embodying or assuming the supernatural identity of Huitzilopochtli. He also speculates that the stone might have been originally displayed in front of the king’s palace in ancient Tenochtitlan, in front of what is now the Palacio Nacional in Mexico City. In his tentative hypothesis, Stuart argues that two other signs on the stone, which frame the face and create the circular design of the stone, refer to “sun” and “market” and that they are references to a substantial market and the palace of Montezuma II that have been documented near the stone’s found location. Historical texts published by the 16th-century Dominican friar Diego Durán refer to an “image of the sun” in the same area, indicating that it may have been on display in or near what is now the Plaza Mayor in Mexico City for decades after the 1521 conquest of Tenochtitlan by the Spaniards. Stuart’s full findings appear in the journal Arqueología Mexicana.